I was born and raised in Wausau Wisconsin to a family that was very active in the outdoors namely hunting and fishing. I should clarify that my father was very active outdoors my mother stayed home and enjoyed a quiet empty house while dad dragged his three sons off into the woods all day. Growing up we spent so much time outside every weekend that we could hardly fathom what people did with their free time if it wasn’t pursuing an animal with rod, gun, or bow. Aside from brief dabblings in canoes and one time in a kayak as a kid, my first serious go at paddle sports came in my early twenties when lifelong friend Neil Baertlein and I borrowed an aluminum Grumman canoe for a four day downriver canoe trip. We talked Neil's little brother into giving us a ride to the headwaters of the Wisconsin River. Then with a grand total of about 10 hours of paddling experience between us we dropped the canoe in the water with a few days worth of provisions and a plan to see “how far we could get downstream”. That was one of my first experiences with camping that didn’t involve a car and strings of plastic owl lights. We ran low on food, the fish didn’t bight, we were cold at night, and Neil got more sun burned than I’ve ever seen before… but God did we have a good time. More runs down the Wisconsin River and other local rivers followed until just after graduating from college I ran the entire length of the Wisconsin River from its source near the Michigan border 300+ miles to where it meets the Mississippi. That trip cemented my love of paddling and planted a seed of interest in the seaworthiness of kayaks. I couldn’t shake the desire to be on the river. After a summer with a barn building crew in Sparta Wisconsin I made the big leap out of Wisconsin by moving to Fort Lauderdale Florida. My friend Neil (then in Florida for grad school) had magically found me an apartment right on one of the many finger canals in the Fort Lauderdale area. Having just moved in, my apartment was sparsely furnished with items loaned to me by friends, even my bed was a borrowed mattress on the floor. I didn't have a microwave, and my dishes consisted of a single complete setting of bowl, plate, knife, fork, and spoon. But being surrounded by so much water, there was nothing I wanted more than to get back on the water. Somehow all of the things most folks consider necessities took a back burner to a new kayak. I lived (and paddled) for three years in South Florida exploring much of the waterways and coastline from the Everglades to Fort Lauderdale. From there I moved on to Santa Paula California (near Ventura). 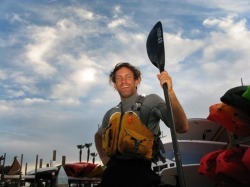 Within months I was hooked up with the California Kayak Friends club and from the likes of local paddling legends "The Old Farts" I learned all of the local put-ins and paddling destinations. Through that club I met Duane Strosaker who got me started on long crossings to the Channel Islands which lie off shore from the Ventura and LA county coast. After four years in of paddling in the Ventura area I decided to finally scratch the itch to try whitewater kayaking. I booked a lesson with Aqua Adventures in San Diego and met our instructor Jen Kleck on the Kern River just outside of Bakersfield. Long story short, we hit it off and within months I was settled down in San Diego working for Jen in her shop. I thought I knew what I was doing in a kayak until I started working with Jen on the water. With her guidance and LOADS of practice I finally honed my skills to where I feel I can handle a kayak fairly competently. Now after ten years away from home I'm answering an undeniable call to be back with my family. Faced with a rare "between jobs" moment of my life, I've decided to finally take on the trip I've been thinking about since I traced my finger on a map of the Wisconsin River as a kid.